The third entry to the Insidious series flashes back to before the events of the first film, where teenager Quinn Brenner (Stefanie Scott) has lost her mother in a tragic accident, and seeks out the help of psychic Elise Rainier (Lin Shayne) to try and communicate with her within the afterlife. However, Elise's attempts to do so go horribly wrong, releasing a dark entity that slowly pursues Quinn with malicious intentions. 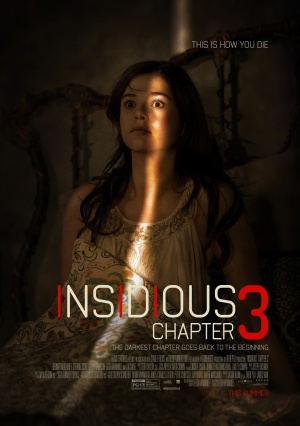 Insidious: Chapter 3 gets many things right but a lot of things wrong. It's key issue is pacing; the editing is sloppy, with scenes cutting away at random moments before reaching an apparent conclusion or resolution. There's a really good story beneath the rusty surface, but the emotional weight it needs is never truly explored - as a result, many characters are poorly developed and their personalities aren't truly interesting. We've also got, now and then, more stupid moments of misplaced comedy in scenes that really can't accommodate it. On a flip side, Chapter 3 has some genuinely fantastic jump scares that convey some truly fearful images instead of being cheap attempts to make you scream. The rendition of the Further is just as evocative as it was in the previous instalments and there's a dark and brooding atmosphere in each scene set within it. In fact, most scenes set within the Further make up some of the best parts of the entire film. Except the climax. It is hard for me to explain this without spoiling, so you'll understand more if you see the film. It essentially transitions from an eerie horror flick to a ridiculous borderline action film with some embarrassing 'fight scenes' and a severe case of melodrama. It's not the climax the film deserved after such an effort to build a strong layer of tension. Chapter 3 benefits overall from good performances, rich visuals, and some exciting scares, but it's sadly bogged down by an unfocused narrative and severe pacing errors.